It’s time for you to Say Yes for Homes! and tell the Board of Supervisors that you support housing policies to help build vibrant communities by addressing the housing shortage. Sign up to speak at one of the Loudoun County Public Hearings about the draft Loudoun 2040 Comprehensive Plan. Supervisors are hearing a lot from people who do not want another home built in Loudoun County. People who oppose future residential development are mobilized and they are vocal. We all know that people love Loudoun County. We also know that there is a lack of housing inventory. 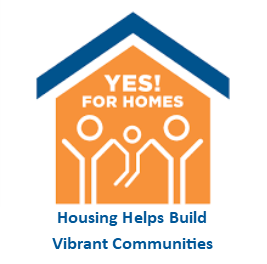 We need you to Say Yes for Homes! and support the housing policies and strategies in the draft Plan that will help address the availability and affordability of housing. The Public Hearings will be held on Wednesday, April 24 beginning at 6:00.p.m. and Saturday, April 27 beginning at 9:00a.m. Just call (703) 777-0200 to reserve your 2-minute spot. Sign up begins on Friday, April 5th at 8:30a.m. Local teachers, first responders, and other government employees live near where they work! Your children find homes they can afford nearby and out of your basement! You see your grandchildren grow up without having to pay for a flight to visit them! Builds better communities by targeting areas that can accommodate increased residential density. Improves public facilities by increasing transportation options and creates more parks and trails. Keeps Loudoun unique and desirable by protecting the natural and heritage resources. Demonstrates fiscal responsibility and accountability and maintains the sound fiscal health of Loudoun. You can also Say Yes for Homes! by sending a letter or calling Supervisors. Use the following link to send an email the Board of Supervisors and your email will go to all nine Supervisors. Or call the comment line for the Supervisors and leave a message at (703) 777-0115. Click to read and download the DAAR Statement on the draft Plan. Let Your Voice Be Heard! Say Yes for Homes in Loudoun County! With planning, Loudoun County can accommodate needed residential development AND retain the unique qualities in Loudoun County! Questions? Contact Brenda Morton, (703) 777-2468 or bmorton@dullesarea.com.